The Department of Transportation concluded there was no evidence of discrimination when David Dao was dragged off a United Airlines flight in April. Federal officials are not punishing United Airlines for forcibly removing a passenger from one of its planes. Back in April, aviation security officers dragged David Dao off a plane heading to Louisville, Kentucky, after the airline involuntarily bumped him from the flight. 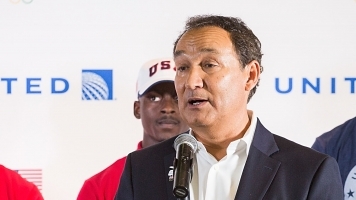 The incident quickly spiraled into a PR nightmare for United. The Department of Transportation investigated and concluded there was no evidence of discrimination. It sent a letter to United in May saying no fine would be imposed. Flyers Rights, a passenger advocacy group, obtained the letter through a Freedom of Information Act request and released it to the public Wednesday. The group's president criticized the DOT's decision, calling it "a dereliction of duty." "We generally pursue enforcement action when a carrier exhibits a pattern or practice of noncompliance with the Department's consumer protection regulations and Federal anti-discrimination statutes that we enforce," the DOT's letter reads in part. The DOT did call out United for not providing Dao and his wife with a copy of the federal rules about what airlines should do when they need to bump a passenger from an oversold flight. Though, the DOT did acknowledge that United might not have had time to do so, since Dao and his wife quickly left the airport after the incident. It's worth noting that United's spokesman said in April that the flight Dao was on was not actually overbooked. United's been trying to improve its customer service since the incident. The airline is working on a way to handle flights that could become overbooked. And it adjusted its policies regarding the removal of passengers already in their seats. United settled with Dao earlier this year for an undisclosed sum of money.